Translating your iPhone application is becoming more important day by day. US is still the biggest market but others are growing fast. 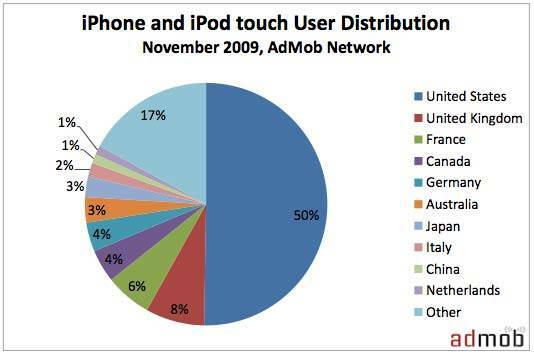 Based on AdMob report, iPhone is growing in Europe and Asia faster than in US. In Japan alone, growth has been 350% from January to November 2009. Currently iPhone is available in 96 countries. Looking the pie on left, about 65% of AdMob (Note! These numbers are based on web usage, not the actual sales) traffic is coming from English speaking countries. Rest 35% is heavily fragmented and basically covers rest of the world. From this you could probably figure out already that you should localize your app at least to French, Germany and possibly Japan. You may even think that it does not make sense to localize at all as those three countries will cover only 13% of the cake. And I would say that you might be right if you think about localization like you do now. Did you notice those others? Others is the second biggest part of this pie with 17% share. It doesn’t make sense to localize your application to these “others” as it means tens of different languages. It would cost you quite a lot in case you go with that route. Well adding up those 17% with other non-english countries, you end up to 35%. Nice number and in actual devices it means 27 million devices (total 78m). In potential customers it is 27 million potential customers more for your application. Our solution to make this happen with minimal effort and costs is crowdsourcing. It’s really difficult and expensive to handle all of those languages as the market is so highly fragmented with any traditional methods. Basically by crowdsourcing we mean outsourcing the localization work to your users. With our platform, it is possible just to upload your original English content to our web service and give the link to your users. They will take care of the rest. You just download ready-made translations and compile them into your application or use our API’s to fetch them over the air. Let your users know about the possibility and they will translate if they like your product. Even if the product is commercial, it works (we’ve done it, see the previous posts). Our goal is to take care of the whole localization process so that we help your users to do translations like they were professionals. Trust your users, they’re using your product which means they trust you. They know how your product works as they are the actual users. Because of that, your community can take care of the translation, validation and even localization testing on your behalf. This also means that you don’t have to guess the languages you translate, your community will translate the languages they need. This is how you turn your translation projects to lean projects. Try it out at http://www.getlocalization.com. We’ve 30-day free trial included in all our plans. We are launching a new version today with totally new UI experience. Especially we’ve now focused on developing developer tools to manage languages and people more efficiently. We are also announcing private spaces for companies who want to give their professional translators, developers, project managers and QA professionals best possible tool to manage and handle all the translation related tasks. We’ve also announced our official plans. Prices now start from 19.90€ (of course we’ve still our free plan for OSS/non-profit projects). Most recommended plan for e.g. mobile client or web site localization is Single plan. Single plan provides efficient tools to crowdsource your application translation work to your users. And it is really working, check our product GoogaSync, a commercial software for syncing Google Calendar and the whole translation process is crowdsourced. Even you can participate to the process! Check out the new version and please send us feedback. We really appreciate highly all the feedback we get! I’ll blog soon more about how to utilize new Get Localization features in your application, stay tuned.